BONUS GIFT! when you subscribe. SUBSCRIBE AND RECEIVE A FREE HAIRDORABLES PRIZE PACK! 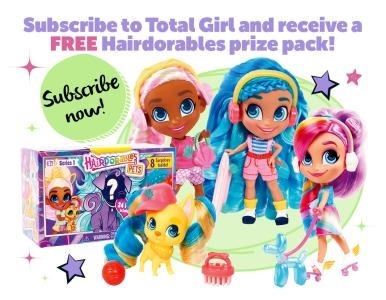 Subscribe to Total Girl now and you’ll get a FREE* Hairdorables prize pack valued at $37.98! The girl squad with ‘Big Hair Don’t Care’ attitudes, have been one of the hottest toys this year! Get excited because Series 2 is out now with all new styles, colour reveals and ’dos – did someone say buns and braids?! There are 26 dolls to collect, including a rare and an ultra-rare doll with mix-and-match outfits and endless styling possibilities – ooh! Pull, peel and reveal 11 surprises to unwrap the unique talent of the Hairdorables girl hidden inside. P.S. How cute are their pets?! Check them out on the Hairdorables YouTube channel! If you are under 15 years old, you must give this Privacy Statement to your parent and get their permission to subscribe to Total Girl. Offer available to new, renewing or extending, for a minimum of 1 year, Total Girl print subscribers from 15/4/2019 until 12/5/2019 or while stocks last. We reserve the right to replace the gift for one of equal value should we run out of stock. *Free subscription gifts available to Australian subscribers only. Subscriptions commence with the next issue to be mailed. Please allow up to six weeks for delivery of your first issue and eight weeks for separate delivery of free subscription gift (after 14/5/2019). This offer cannot be used in conjunction with any other offer. Prices applicable to Aust and NZ residents only and include GST. Savings based on cover price. When you subscribe, nextmedia P/L collects personal information for the purpose of processing your order. Refer to nextmedia.com.au for full Privacy Notice. NOTE: SUBSCRIPTION COPIES DO NOT COME WITH COVER GIFTS.